Forex broker Markets.com offers a $25 forex no deposit bonus to forexbonusfree visitors. You don't have to deposit yourself to get this welcome bonus, it is a real forex no deposit bonus. What makes this forex welcome bonus even more interesting is that Markets.com is one of the best forex brokers. Not only is their trading software first rate, they also provide excellent customer service. It's also worth mentioning that Safecap, which owns markets.com, is regulated by CySEC (license no. 092/08 and FSB (no 43906). New customers are eligible to receive guidance from an expert trader who can help set up a customized trading strategy and advise on market movements. 3 $25 will be added to your account and you will be able to start trading immediately. If you open an account in euro, you will get €25 free. If you open a dollar account you'll receive $25 and opening an account in British Pound will get you £25 free. The copy of your ID and proof of address is also necessary to ensure compliance with applicable regulations. Proof of address can be a utility bill or a bank statement. If you have questions about this promotion, you can email or call Markets.com directly. For the UK: +44-20-3150-0380. For Australia: 61-2-8014-4929. For Germany: 49-800-588-8405. 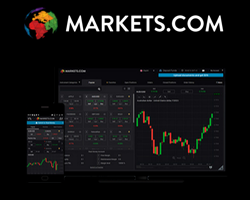 Markets.com is operated by Safecap Investments Limited, which is licensed and regulated by the Cyprus Securities and Exchange Commission (CySEC) under license number 092/08. Commodities: e.g. oil, gold, silver, coffee, corn, cotton, sugar, rice. Bonds: e.g. American, Japanese and British Bonds government bonds. These kind of promotions don't come along that often and we can't guarantee how long Markets.com will keep it available.